1. 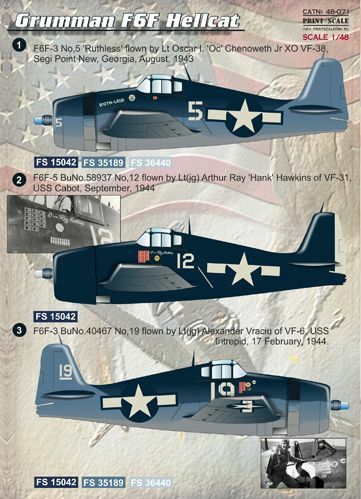 F6F-3 No,5 'Ruthless' flown by Lt Oscar I. 'Oc' Chenoweth Jr XO VF-38, Segi Point New, Georgia, August, 1943. 2. F6F-5 BuNo.58937 No,12 flown by Lt(jg) Arthur Ray 'Hank' Hawkins of VF-31, U.S.S. Cabot, September, 1944. 3. F6F-3 BuNo.40467 No,19 flown by Lt(jg) Alexander Vraciu of VF-6, U.S.S. Intrepid, 17 February, 1944. 4. F6F-5 No,8 flown by Ensigns Alred R. Wood & Edward W. Olszewski of VOF-1, U.S.S. Tulagi, August, 1944. 5. F6F-5 No,99 'Hanger Lilly' flown by Cdr Hugh T. Winters Jr., Co Air Group 19, U.S.S. Lexington, November. 1944. 6. F6F-3 BuNo.25813 No,13 'My Own Joan II' flown by Lt C.K. 'Ken' Hilderbrandt of VF-33, Ondonga, 25 December, 1943. 7. F6F-5 VS1 flown by Lt Cdr William E. Eder of the 'Victory Squadron', 1945.